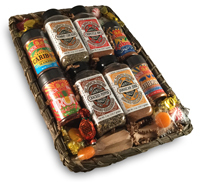 Gift basket for man, BBQ and regional seasonings for cooks, grill masters, BBQ fanatics and lovers of tasty things. Gift Basket for Your Man! 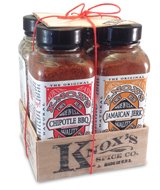 Man gift baskets only available at Knox's Spice Co and select gourmet outlets listed on our "buy local" page. For the person who who loves to cook almost as much as they love you. If you know somebody who loves to cook, BBQ or grill you are in the right place. This company was started by two men who love exactly the same thing. This is also why we feel we make the best seasonings. Not because we feel our cooking is any better than the next person but because we eat what we cook and when we decided to make seasonings for the open market we stuck to your guns. We sell what we use not some thinned out version of a seasoning but a full on quality meat seasoning. 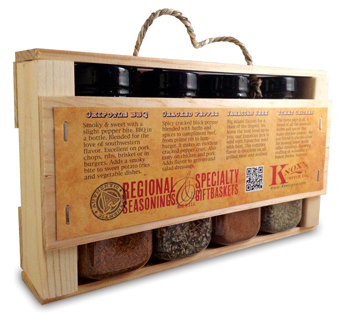 Our seasonings are 100% natural with no fillers or coloring agents and are not salt based. Compared to other commercial seasonings they are low in salt. They are what we use to make great BBQ as well as many delicious side dishes. BBQ seasonings and dry rubs that capture a region or are made just for specific cuts. These regional and specialty seasonings make perfect gifts for Christmas, birthdays, housewarming or just to say you appreciate someone. Combine all that flavor with a couple pounds of beef, chicken, pork, fish or game and you will have fond memories of some truly excellent eating. Gifts for people who love to grill and cook. Great gift baskets for sportsmen, outdoors men and tailgaters. Also makes a memorable house warming, Valentine, Father's Day, going away, welcome back, happy summer, get well gift baskets for men or whatever occasion you may need to BBQ something gifts. Unique baskets and sets built when ordered from fresh stock and sent out within 24 hours. Gift Baskets only ship within the continental United States. A card is included free of charge. Make sure to type in what you would like to say when ordering. Enjoy! Delicious and brightly packaged. An excellent and unique gift for cooking enthusiasts, BBQ grill masters and food lovers alike. The artwork was designed by Bryan Knox and hand silk screened in limited edition. 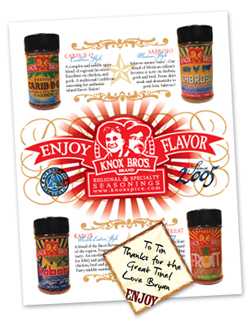 These are our first Knox Brothers Brand seasonings and our first and currently our only gift box. Kabob seasoning for a mediterranean-middle eastern flavor. Excellent on lamb as well as chicken, beef and pork. 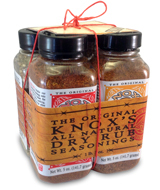 Our market style seasoning is sure to get neighbors peeking over the fence. Mexican style Sabroso seasoning for an authentic south of the border taste. Quality tested on chicken and pork but delicious on beef as well. Tasty as a fajita seasoning. 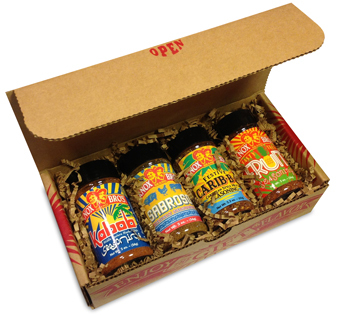 A tasty and slightly spicy Caribbean style seasoning, Carib-b-q. Island flavor in a jar. This regional favorite makes delicious pork chops and chicken. Tasty Treat Fruit seasoning. A dessert seasoning sprinkled onto fresh fruit, traditionally mango and pineapple but delicious on any sweet fruit. The tart and spicy flavors are an excellent compliment to sweet fruit. Tasty treat indeed. Personalized card and recipes supplied. 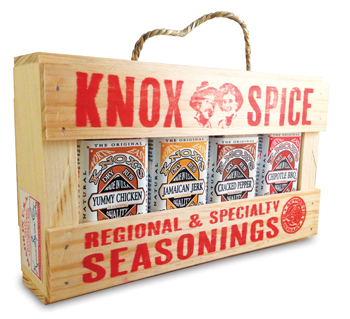 Our four Knox's Spice Co grilling seasonings crated up complete with a handle. The front is stamped in red with a logo and contents. The back has a paper label attached with descritions of the bbq seasonings. These meat seasonings are excellent for flavoring chicken, pork, beef and fish but also handy for dressings, gravies and vegetable dishes. Over 1 lb of seasoning in total for your grilling and bbq enjoyment. The crate is hand made in the shenandoah Valley of Virginia excusively for Knox's Spice Co. An uathentic and unique gift for anybody who enjoys quality seasonings for cooking. "Tasty Grilling Planks BBQ Gift"
Plank cooking survival kit. A unique gift for men who love the extra flavor plank cooking provides. 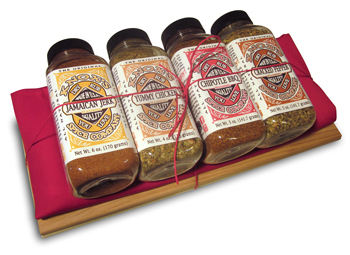 Gift comes with our 4 dry rubs (Chipotle BBQ, Cracked Pepper, Jamaican Jerk & Yummy Chicken), a heavy duty red apron and 2 cedar grilling planks. Personalized card and recipes supplied. Plank grilling is a great way to BBQ anything from fish to pork shops. It allows the meat to not only have the flavor of the seasoning but a mild flavor of the wood making a delicious gift for a unique BBQ or grilling experience. Our original gift basket and our best selling. 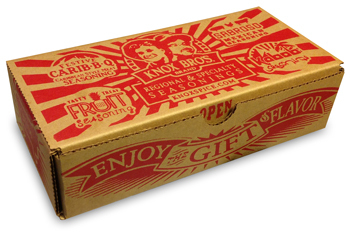 This is like giving the gift of big BBQ flavor packed up just for men. 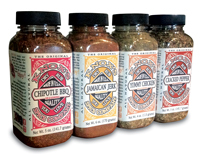 All 4 Knox's Spice Co's regional and specialty seasoning rubs; Yummy Chicken chicken seasoning, Chipotle BBQ southwest seasoning, Cracked Pepper beef blend and Jamaican Jerk for all things island, Ja Mon! Carefully arranged in a kitchen towel lined basket and packed with Ozark hickory chips, shrink wrapped and tied with a red cord, pictured below. Our original BBQ gift. All you need is a fire and something to BBQ. If men start the grill with the basket it is a 100% useful gift. 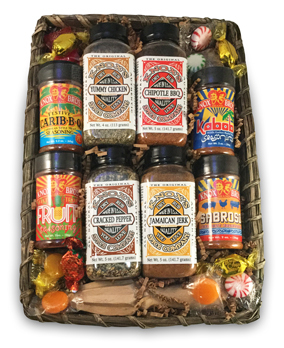 Unique in caparison to most BBQ or any other gift baskets. Personalized card and recipes supplied. Like a spice cabinet in a basket. Possibly the smallest and most unique of all gift baskets as that it is not mostly basket. No extra fluff here, our 4 BBQ dry rubs (Chipotle BBQ, Cracked Pepper, Jamaican Jerk & Yummy Chicken) in our wood basket. The gift of flavor. 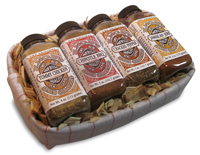 A solid 1 pound3 ounces of all natural gourmet BBQ dry rub in an attractive gift set. Our gift set includes all 4 Knox's Spice Co. BBQ dry rubs (Chipotle BBQ, Cracked Pepper, Jamaican Jerk & Yummy Chicken) in our attractive gift set.